A novelty at Munich 2013. Parallel aggregates of very well defined Clinoatacamite crystals. They are large- sized for the species, platy and have rounded contours. 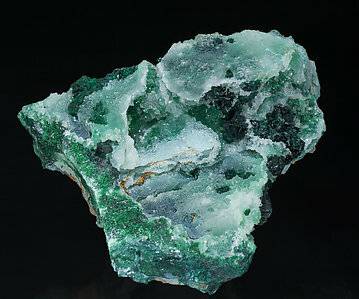 Furthermore, the crystals, on matrix, are extraordinarily bright, with a very deep green color and are partially coated by small Gypsum crystals. A sample out of the ordinary, worthy of being in the best collections. A novelty at Munich 2013. 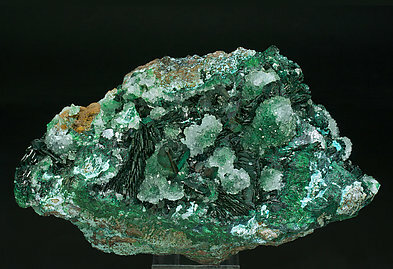 Aggregates of Clinoatacamite crystals with very well defined faces and edges. 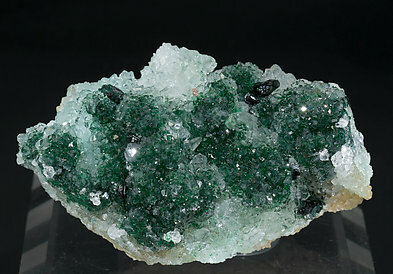 Most of the Clinoatacamite is included in small transparent Quartz crystals, but some crystals and groups, very bright and with very deep color, are external and very aerial. A novelty at Munich 2013. Aggregates of crystals with very sharp edges, very bright, with a very deep color and on matrix, with Quartz.